In the dark of night well before dawn, a Volkswagen bus travelled past the hedgerows and hop farms of Kent County, England. Mark Carpenter was behind the wheel on holiday, in September of ’69, two years before he joined Anchor Brewing. He was headed to the city of Maidstone, where unbeknownst to him, a single pint of ale would inspire him to create Mark’s Mild over forty years later. The trip wasn’t a grand tour of Europe’s historic breweries. In fact, he drove into Maidstone with a certain amount of innocence, as far as the beer world was concerned. As he rounded one corner in the dead of night, a lonely billboard startled him. 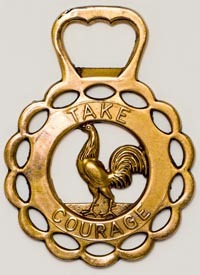 In large glowing letters, it read Take Courage. He thought it was a World War II relic, but it was really an ad for the Courage Brewery in Maidstone. Carpenter was simply visiting a friend, who caught his eye in France. She lived in Maidstone, so he followed her to England. They spent three weeks together hanging out with friends in the city and countryside, where the hop harvest was in full swing. Carpenter toured a few farms and spent countless hours over pints in Maidstone’s plentiful public houses. 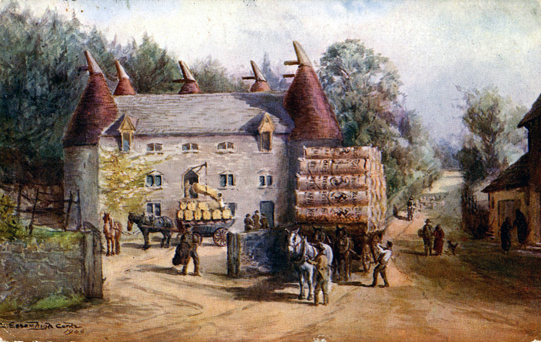 A Maidstone oast house, circa 1906. Hops were kilned (dried) in oast houses. It was during one of these visits to the pub that Carpenter discovered mild ale, a lightly-hopped, low-alcohol beer that typically accentuates caramel, toffee, and nutty flavors found in malt. In the late 1960s, this historic style was largely in decline. Drinkers were starting to favor bitter and lager. In 1960, mild ale accounted for 61% of draft beer consumption. By 1980, its prominence dwindled to just 14%. If Carpenter had arrived in England ten years later, he would have been hard pressed to find mild ale. 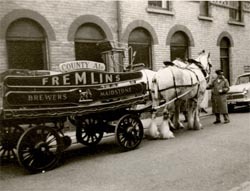 A Fremlins beer wagon in Maidstone, circa 1960. Fremlins was one of three breweries in Maidstone at the time Mark visited in the 1960s. Ten years later, all were closed. Mark Carpenter and the Anchor crew in the early days. 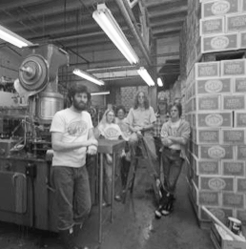 Over the years at Anchor Brewing, as Carpenter traversed the ladder of responsibilities, from the bottle shop to brewmaster, he always wanted to make a mild. He would search them out during trips to England with Fritz Maytag, but by then, there were only a few London pubs he could count on to find a mild. His opportunity finally arrived, some forty years later, when Anchor Brewing launched its new Zymaster® Series this year. This new series of unique beers is devoted to exploring brewing traditions, exceptional ingredients, and unusual flavors. After retracing the early history of California Lager with Zymaster No. 1, Carpenter decided to create a mild and his first pint in Maidstone was the inspiration. Carpenter already had a few traditional recipes, but deviated from them ever so slightly, avoiding black malt. For Mark’s Mild, he chose Maris Otter as the primary base malt, added some crystal malt, and then utilized a small amount of invert sugar, which imparts color and a unique caramel flavor. It’s an English technique that dates back to the 1700s. In addition to the malt and sugar, Carpenter added a single infusion of English Goldings hops to the boil, before the wort was transformed by Anchor’s ale yeast in open fermenters and finished at 4% alcohol by volume. 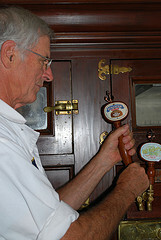 Mark Carpenter pours a Mark’s Mild in the Anchor Taproom. The first brew of Mark’s Mild took place in March. Carpenter made almost 3,000 gallons. He doesn’t have a pilot system for experimental brews, so everything needed to go as planned. While this may seem risky, Anchor Brewing’s team is used to the challenge. It happens every year during the production of Anchor’s Christmas Ale, since the recipe is always evolving. The beer has a wonderful malty flavor that harbors hints of toffee, chocolate, and nuts. There are also subtle fruit notes imparted by the yeast. It’s luscious, yet thirst-quenching, and explores the notion that beer doesn’t have to be extreme to be extremely interesting, according to Anchor Brewing’s resident historian, Dave Burkhart. Mark’s Mild is ultimately a sociable beer, and Anchor Brewing hopes it will inspire moments and trigger memories for beer drinkers everywhere as they gather with friends, just like Carpenter back in Maidstone, more than forty years ago. Brian Stechschulte is a beer writer and photographer based in San Francisco, who also volunteers as program manager for the San Francisco Brewers Guild. As a member of the Guild, Anchor Brewing supports the group’s mission, which is to unite those who make local beer with those who love it, and revive the vibrant heritage of beer brewing in the San Francisco. Great article, Brian. You really captured a moment in time with Mark’s story. I too love milds and I’m so thrilled to hear about this beer! Where can we find it other than (I’m assuming) the tap room at Anchor? Hi Melanie, thanks for your interest! The SF Chronicle published a nice write-up that lists a few Bay Area places where you can find Mark’s Mild. We definitely recommend calling ahead of time to confirm availability. And yes, you can get Mark’s Mild right now in our taproom as part of the tour tasting. How do I get my hands on some of the Zymaster Marks mild??? I’ve got a friend in Illinois that would owe me HUGE. Hi Kevin, Mark’s Mild Magnums are available through our taproom at the brewery here in San Francisco. Even if you don’t have a tour reservation, you can swing by the brewery during business hours (Mon-Fri 9am-4pm) and we’d be glad to help you! Thanks for your note!